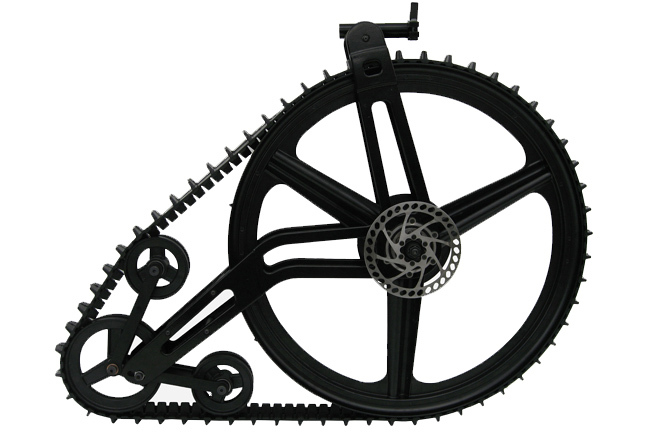 With the KtraK Snowmobile Mountain Bike Kit you can take any mountain bike and equip it with this back wheel with a tread on it. Simply pull off your tire and set the ski assembling, then take it with you on the chair lift on the way to the top of the snow track. You’ll have the best biking AND skiing of your life! Ride your sport bike not on the crowded streets of the town, but on the snowy tracks in the beautiful mountain! 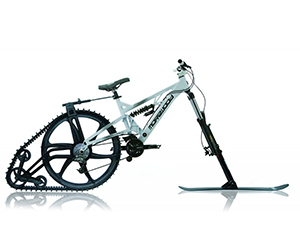 You wouldn’t have considered skiing with a bicycle some time ago, but now it’s pretty possible and of course sooo fun! The bike snow kit modifies the bike to make your experience much cooler and easier than regular skiing!